Passes can be purchased at any point during the year and are valid for 365 days. 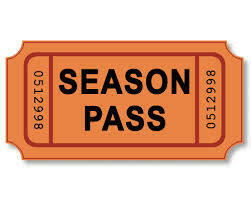 Season passes cannot be transferred to other persons and prices are not prorated. You will need to provide us with a jpg photo of yourself in order for us to make your member pass. Membership passes are not refundable and non-transferable. Membership passes are valid only for the person who’s name is on the pass. You MUST present your pass with you to receive your free admission or discounts. No exceptions. Membership discounts cannot be combined with any other coupons, sale discounts, sponsored team benefits, military discounts, etc.